Motivational text/graphics are the rage these days, and seem to be pretty high up on the content food chain for Instagram and Facebook. I had my doubts at first, but was very pleasantly surprised at the reactions and engagement resulting from these quotes once I started adding them to my own social media schedule. You’ll also need a big cover graphic for your blog posts, as well as a few other sizes of the same graphic to make sure the right image size shows up on your various social media platforms. Because you ARE sharing your blog posts on social media, right? Personally, I create my blog graphics in a variety of sizes. One each, sized for Twitter, my Blog (this one also works for Facebook and LinkedIn), Pinterest, Instagram, and a special Instagram size with a bite size nugget from my post. If you share this post on your own social media channels, you’ll see some of the different sizes I’ve created. Create images and graphics in several sizes to promote your content on social media. Now if you know anything about creating graphics, you’ll know they can take a bit of time to create. Especially if you don’t really know what you’re doing. Plus, it’s probably not the best use of your time anyway, when you can have someone else do them for you. Someone who creates graphics on a regular basis. 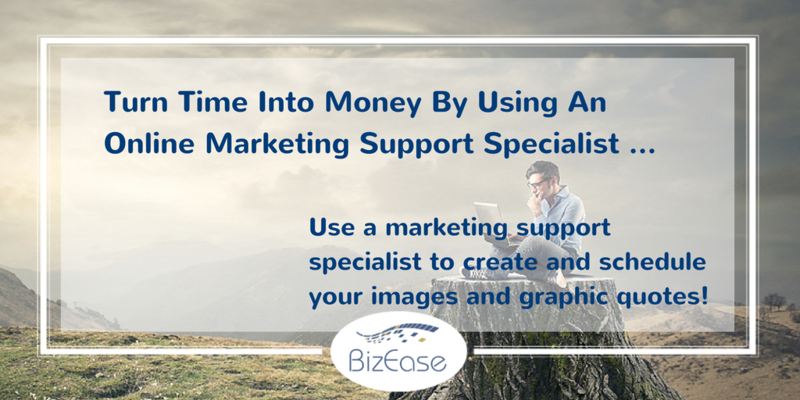 What might take you a quite a while to do, might take your online marketing support specialist 1/2 the time or even less than it takes you. If this is a service you’d like to add to your social media arsenal, schedule a complimentary 20 minute consult with us to find out about our graphic/quote packages and see if we are a good fit for your company!